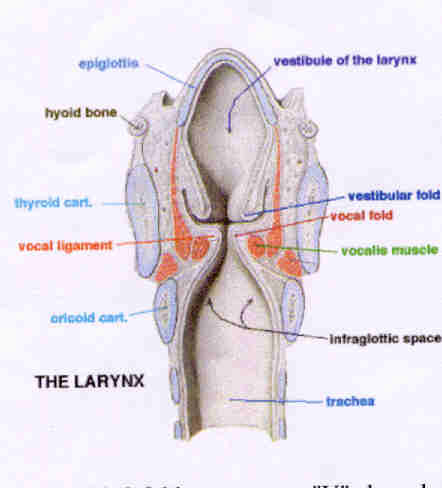 The human voice originates in the larynx, commonly called the voice box, illustrated above. It sits at the point of the neck, where the air passage to the lungs called the trachea, and the food passage to stomach called the oesophagus, separate into their separate pathways. The larynx has a critical role in swallowing, breathing and production of the voice, all controlled by it’s cartilage and muscle structures shown above as "folds". Contraction and expansion and vibration of the vocal folds with the exhalation of air generates sound of varying volume, tone and quality and these sounds get clearly shaped into speech by alterations in the air space of the vocal tract – the space of the mouth between the throat and the lips, ---caused by changes in the position and shape of the throat, tongue and lips. The development of speech and it’s refinement with language is a process of intense training of thesse muscular structures of the vocal tract, right from early infancy. This is a process which is seriously impeded if the child has a hearing impairment, where it does not know how the words sound, and therefore it does not know how to manipulate the structures of it’s vocal tract in order to produce them. Over a period of time, the related muscular controls may get totally lost due to not being exercised correctly, and the child may become a permanent mute, capable of producing only meaningless sounds. It is therefore vital that hearing disability should ne detected at the earliest point of time possible, and action be initiated with provision of hearing aids and with intense training to preserve and build on whatever hearing levels are available, to establish voice and language skills.